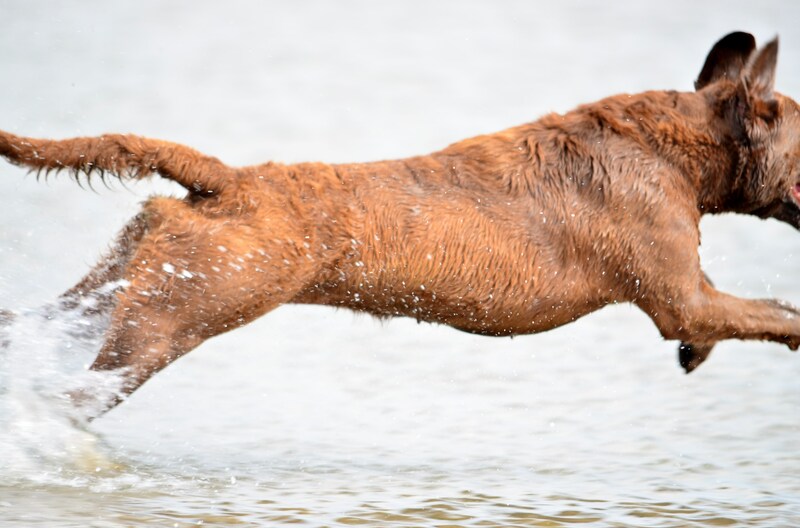 Uisce Madra gaelic for Water Dog. All through the summer I worked on Uisce’s confidence in water. I took her to the lake to practise long water entries, the river to deal with currents and the canal to practise retrieves from across water and through cover. We sat in line with other dogs to work on steadiness and honouring. 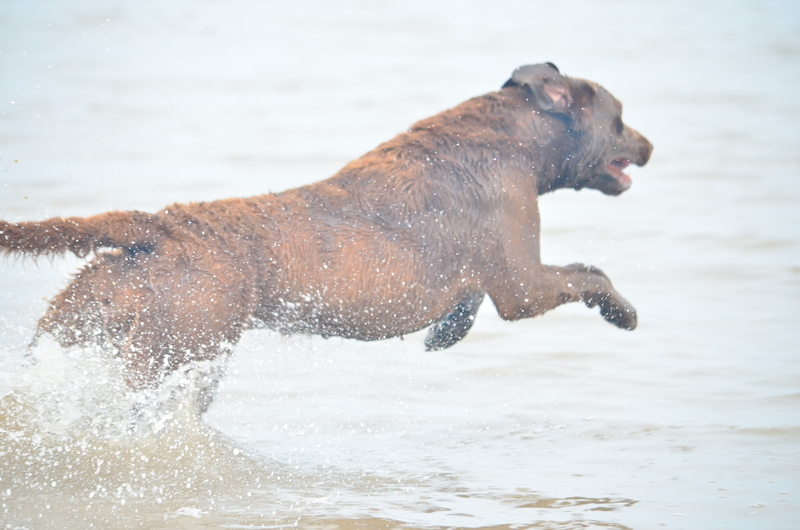 She learned and gained confidence at the lake and on the river very quickly. It was the canal, the narrowest of the water channels and where I would have considered the easiest of the three venues, that she hit a wall in regards to making progress. Water entries became more confident with practise. The problems which the canal presented had nothing to do with her inability to figure out about retrieves from the far side of the water as I had tested her on clean river banks and water ditches without any issue many times. It was so much simpler than that….it was reeds and/or elephant grass!!!! 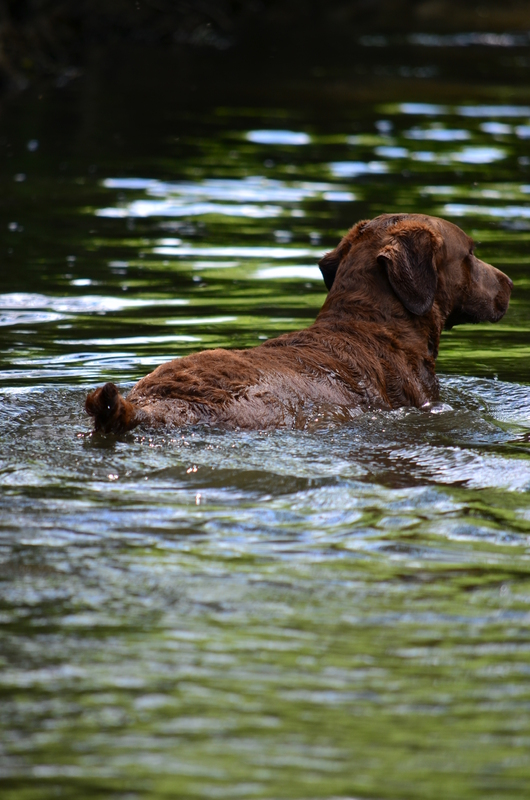 Her entry through the reeds and into water on my side of the canal never caused any hesitation, in fact her water entries have become increasingly spectacular and more chessie-like the more confident that she’s become. Then, however, she would swim to the far bank and just as she hit the reeds she would back off and inevitably her frustration would come through with water circling, splashing and biting. I spent a lot of my time this summer standing on banks and thinking, “okay, how am I going to get round this one? “. 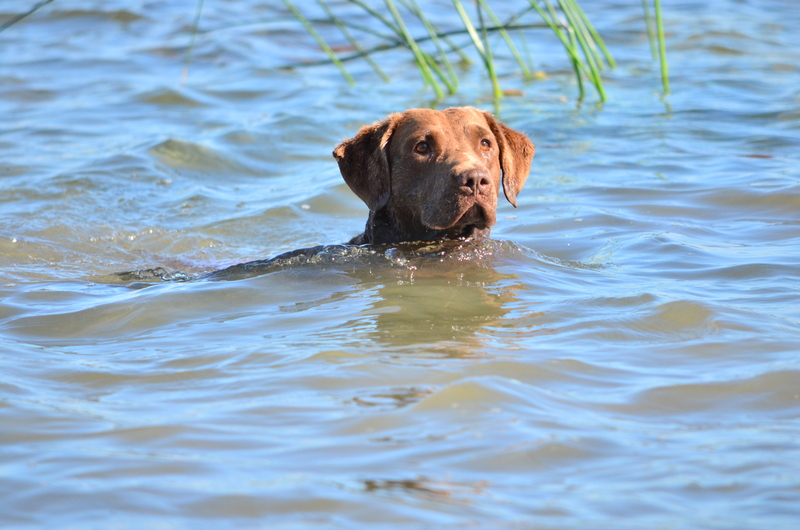 Well I tried everything from sending an older dog across, namely poor Chester again, to make a path through the reeds before her, I brought cold game along to see if the scent of game would draw her through the reeds, I threw dummies just short of the reeds and then further up the bank. And with all these I did succeed in getting her to a point where she would push through on a single seen to just beyond the reeds but no way could I get her up through the reeds to the top on the other side and the more frustrated she became the more she backed off, she was losing confidence. Perhaps it was just this particular set up? Maybe she had developed a mental block about this particular stretch of water? 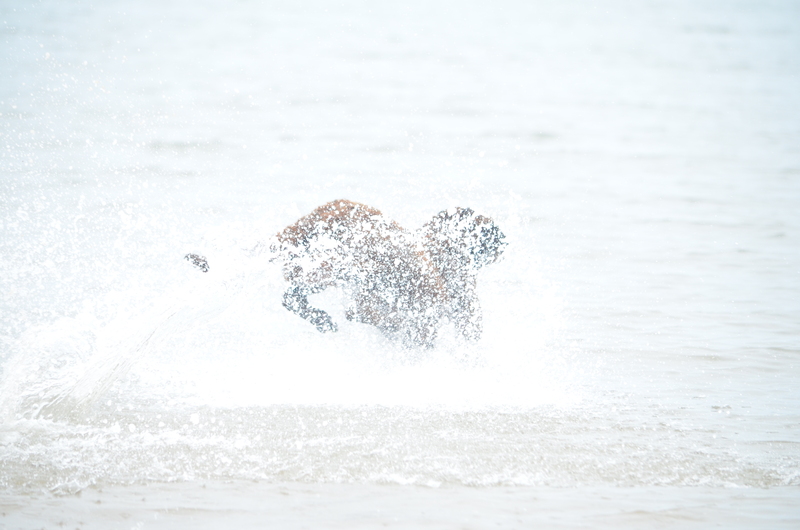 To find out I needed to challenge her on strange water…. So last Sunday I took her up to a small lake near Slane. It was perfectly set up for what I had in mind. Clear water surrounded by elephant grass, the lake is small enough to be accessible from all sides but big enough not to offer temptation for the dog to run the bank. There was a clean bank on a headland from where I placed the thrower, Des, to give Uisce a confidence boost to begin with. As usual I brought along an older experienced dog, this time it was her mother Winnie who would show her the way. Des called the ‘mark’ and I sent Winnie across. Uisce sat patiently by my side, watching her mother and, I hoped, taking notes!! Once Winnie returned Des threw a second ‘mark’. I cast Uisce and she launched herself into the lake, she swam with confidence to the far shore but just as she came to the reeds her ears went back, she engaged the water brakes and threaded water, looking anxiously past the line of reeds but not daring to go through. I urged her on but this only served to increase her worry and she started circling. Des threw another mark into the reed edge which she swam forward for and retrieved with no problems. What to do? On her return she delivered the dummy perfectly and in spite of her anxiety she set herself up to go again, and this has been the pattern. The eagerness and keenness have been my indicators to try and push her past, as I see it, this small problem and execute a solid retrieve. Shouldn’t it simply be a matter of trying to find a way of getting her past her ‘block’ on grasses? Or am I perhaps reading her and the situation incorrectly? Maybe I’m expecting too much from her, she’s not yet eighteen months old, because the rest of her training is so advanced? Maybe too far too soon? Des’ conclusion after watching her on Sunday was simply to accept that this is her level at the moment, that with so much progress gained in the last few months that she has plateaued for now. This is quite possible and something I am more than willing to take on board. We finished her training that day with a simple seen into clear water, something she accomplished with finesse. As we walked back up through the woods reflecting on what we had seen I still had a niggle that I really wanted to find a way for her to learn to get past this sticking point. I didn’t want it to become an ingrained pattern. The plan worked…we set up the recall from two separate points on the lake. The first one I stood on a familiar bank from where she’d retrieved previously but in view of the adjacent bank from where Des sent Uisce when I called her. Once she arrived on shore and sat in front of me she got loads of praise and her favourite treat. The second recall which we set up was one where I stood beyond a fresh bank of reeds and called her to me. This time there was slight hesitancy as she approached the bank where I stood but encouragement from me was enough to convince her that everything was okay. 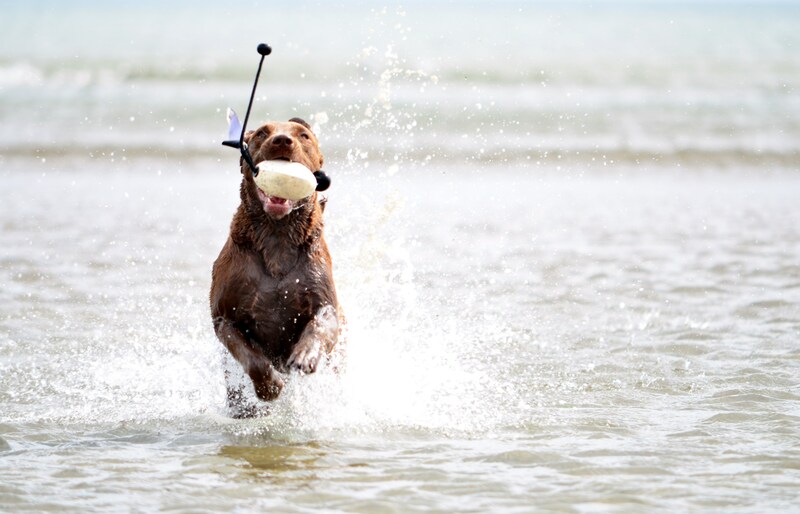 This entry was tagged animals, canine behaviour, dog psychology, dog training, dogs, nature, publishers, short post, writing. Bookmark the permalink. Well done. 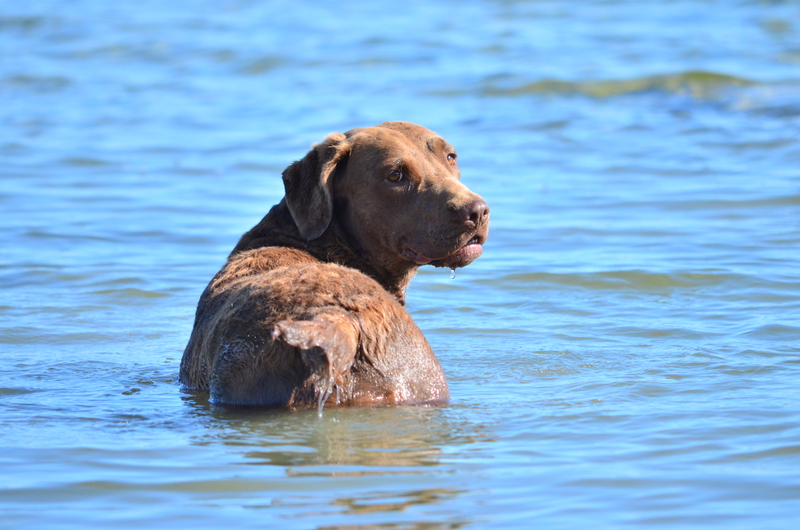 I was about to remind you of your own approach of retrieves with the handler in the water, when you added that you had it cracked. Mary you are going to love me !!! If your that keen at that age then Get A Lab !!!!!!!! Why Richard?? Should I not be working through training issues in a sympathetic manner? 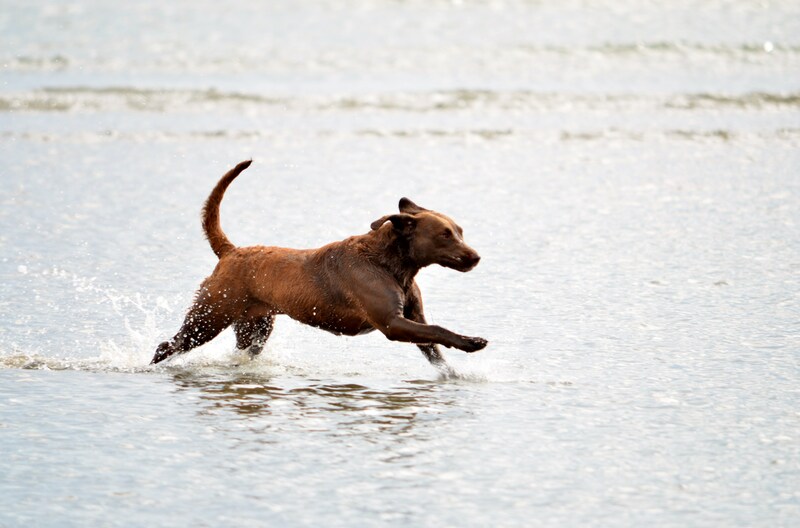 Uisce is about to enter her first working season, it would be irresponsible of me to ask her to enter water and retrieve without being certain she was confident doing so….nothing to do with age….